Many adults feel teen drinking and partying is a rite of passage. We encourage parents to face the current realities and learn why and how adults can change these dangerous social norms. 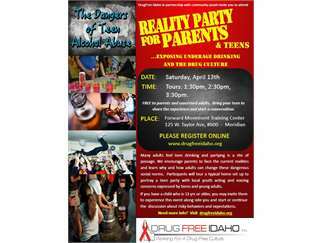 Participants will tour a typical home set up to portray a teen party with local youth acting and voicing concerns expressed by teens and young adults. Teens from our community will host and educate about what the party scene often looks like and some of the risky behaviors that often accompany these parties. Their voices and their concerns will open your eyes to what they are thinking and the pressures they face growing up in today's world. If you have a child who is 13 yrs or older, you may invite them to experience this event along side you and start or continue the discussion about risky behaviors and expectations. Must register for your preferred tour time. Admission is free. Walk-ins not guaranteed entry.